This aluminum safety light platform makes mounting high-visibility safety lights a breeze. 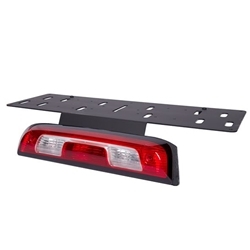 This mount is designed to attach to the high-mounted brake light on model year 2014+ Chevy Silverado and GM Sierra trucks. There is no need to drill any holes, the platform uses a clamp and gasket system to hold it in place. If you wish to use a magnetic mount safety signal, you will need to select the option with a metal add-on plate.